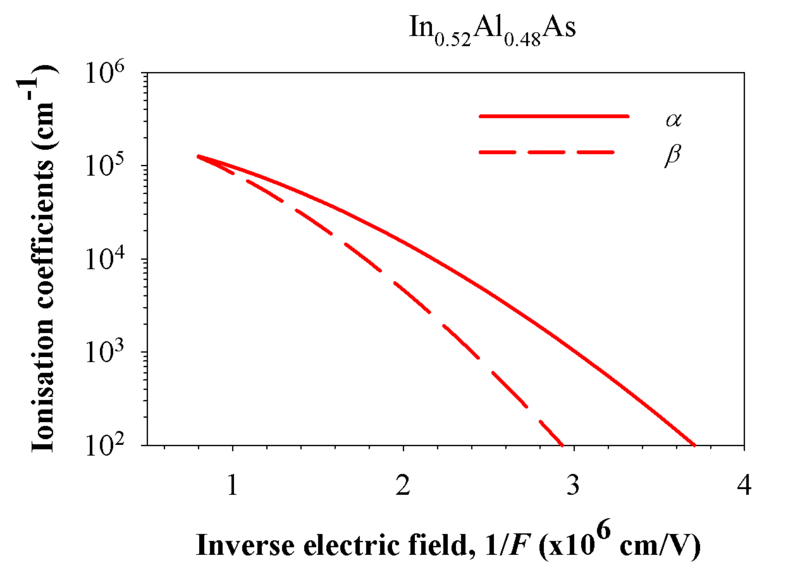 The figure shows the impact ionization coefficients for the III-V ternary semiconductor material, Indium Aluminium Arsenide (InAlAs), as a function of inverse electric field at room temperature. These ionization coefficients were obtained from photomultiplication measurements undertaken on a range of PIN and NIP diodes of different avalanching widths. The above data is from Goh et. al.5. Details of ionisation coefficients over a wide electric field range can be found in Cheong et. al.1 for Aluminium Indium Phosphide and other popular semiconductor materials.